A customer favorite, our steeple lantern fits well with any décor. It's great to sit or hang. 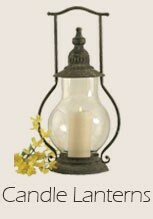 This lantern works best with our 3.5" x 5" fireless candle. Lantern measures 10 1/4" X 21"